Now I read a lot of tweets, and more recently have started listening more using ideas from Voxer or podcasts. I listen to either football podcasts from back home or PE podcasts. Two guys that have a great conversation from different sides of the world are @PENathan and @JoeyFeith, if you don’t follow them or listen to their podcast you should. At school I was in the planning stages of setting up a house system. If you do not know what a house system is, watch Harry Potter, or that is what the kids tell me! Now the school had a house system many years ago, but after speaking to the ex PE teacher, he said it was too labour intensive for one person. Now since September I have been experimenting with GAFE for my department, and along side this I am looking for different opportunities for my students to take part in various sports. Once they leave the school gates at 3pm there is not many opportunities for them to take part in sport in the community. I wanted to start running competitions for them during their lunch periods. That is where I started to think it would be a good idea to start up a house system at the school. Well I am not going to lie, it has taken ALOT of hours to get it to this point, but seems like things are starting to come together. Would like to thank @TeachJDH for a few questions that he has helped me, not just on this project but others as well, so thanks Josh. I remembered reading @PENathan post a while back about recording athletic events using GAFE, and most recently this post. Now I do like what Nathan is doing with GAFE and always looking for ways on how it can be incorporated into his dept/school. Similar to me!! Always looking for ways to work smarter. I took a copy of Nathans original document and started looking at his formulas and what he had done so far. Now I thought it would be impossible for what I wanted but I would say I am 90% of the way complete to having a fully working GAFE approach. Now the best way for me was testing, testing, testing, lots of trial and error and researching on google to what I wanted. I wanted a system that could feed into one another, through manual manipulation and automatic scores through GForms. 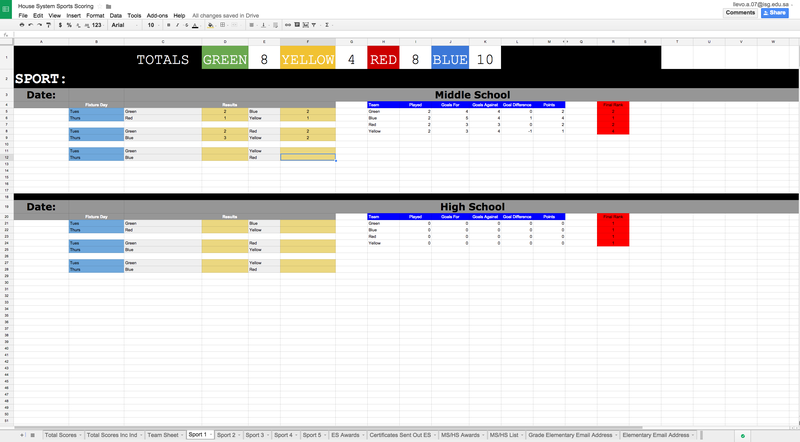 I wanted team games and fixtures to be able to update the score for the competition and the overall scores, and then for the individual awards, I wanted students to take ownership. They will scan a QR code which will be with the teacher, which will take them to a Gform, and complete. 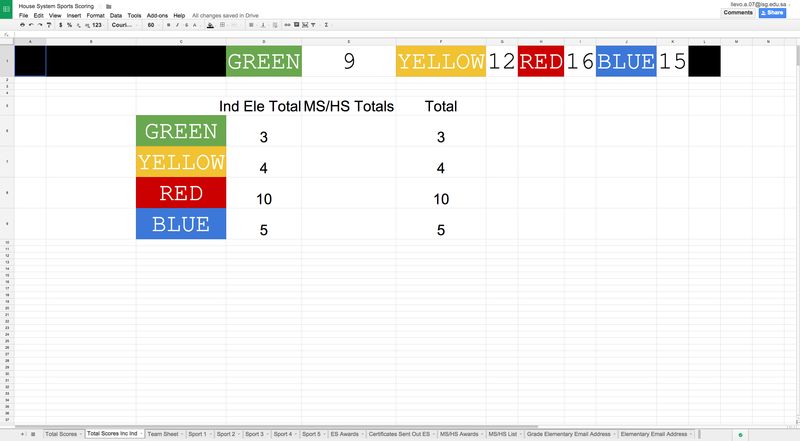 This will then add a score to their house colour and and individual total. Once they have accumulated 25/50/75/100/200 points they will be emailed a certificate to congratulate them using autocrat (this has been tested and works). Autocrat now has a feature that allows for the script to be run on a time delay, ie once a day. This seems to be new, but what a great addition. The Gform ask them for their grade, which then takes them to a list of names just for that grade, then the positive behaviours they have displayed. For the MS/HS students it will be a similar setup but they will have to log into their accounts before they fill the form in, so it can log their details. Only time will tell if the whole system works, but initial tests look positive, and the House system will start in Jan, so will update once it is up and running. Does anyone else use anything similar in their school? As it has not yet started would love to collaborate with anyone to help improve the system before it starts in Jan.
« New member in the PE Dept……Robo Tagger!